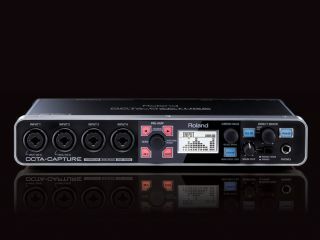 PRESS RELEASE: Roland introduces the OCTA-CAPTURE USB 2.0 audio interface, a 10- input/10-output device for computer-based multi-channel audio production. OCTA-CAPTURE sets a new standard in portable USB 2.0 interfaces, combining premium components, 24-bit/192 kHz performance, and preamp and streaming technology in an affordable and compact unit. Designed for high-level audio production, OCTA-CAPTURE features eight professional-grade VS Preamps with each channel providing a combo-XLR input jack, phantom power, low-cut filter, phase invert, and digital compression. These digitally controlled microphone preamps are built with premium components, resulting in transparent audio with a superior signal-to-noise ratio. The space-saving combo jacks also accommodate ¼-inch connectors, with Hi-Z instrument inputs on channels 1 and 2 and balanced TRS inputs on channels 3-8. In addition, channels 7 and 8 are well suited for high input levels associated with kick drum and snare drum recording. Additional connectivity includes eight ¼-inch TRS output jacks, coaxial S/PDIF I/O, and MIDI I/O. The unique AUTO-SENS function makes it simple for users to set the preamps' input levels when using multiple microphones. For example, when recording a drum set, pressing the AUTO-SENS button automatically sets the optimum input levels for all mic inputs as the musician plays the drums. Never before has it been this fast and easy to set the perfect levels for multiple inputs at once. OCTA-CAPTURE features four software-controlled Direct Mixers, which allow users to set up independent monitor mixes and route them to headphones, speakers, or other recording and mixing devices. The internal 40-bit DSP engine provides superb audio quality, and any input can be routed to multiple outputs for the ultimate in monitoring flexibility. Roland's VS Streaming driver offers the latest technology for powerful low-latency performance with 48-sample ASIO buffers (44.1kHz/48kHz) and unprecedented stability. All popular DAW platforms are supported via ASIO 2.0/WDM (Windows) and Core Audio (Mac) driver versions. The VS Streaming driver is compatible with the very latest computer operating systems, including Windows 7 and Mac OS X 10.6. OCTA-CAPTURE can also be used as an expansion I/O unit with Cakewalk's V-Studio 700 and 100 systems. Thanks to VS Streaming, multiple devices (two OCTA-CAPTURE units or one OCTA-CAPTURE plus a VS-100 or VS-700) can be used without compromising stability, performance, or audio quality. The compact OCTA-CAPTURE can easily be used as a desktop interface, or mounted in a single rack space with the included rack ears. OCTA-CAPTURE comes bundled with the Cakewalk Production Plus Pack, a powerful software suite that includes SONAR 8.5 LE, Rapture LE, Studio Instruments Drums, and more.